An arrogant and greedy Tory government, which feels it has no serious opposition, has produced a level of corruption not known since Lloyd George's government sold knighthoods and peerages in the years after the First World War. Daily we receive new stories of corruption and graft centred on the Tory government and its hangers on. Two ministers were--according to Mohammed al Fayed, the owner of Harrods, who says he did it--paid �000 each for asking Commons questions about the Harrods takeover. We can be sure that these two are not isolated examples. Two backbench MPs have been revealed as demanding �000 each to ask questions in the House of Commons. There are rumours that one cabinet minister has taken a �0,000 bribe. The whole lobbying system, with private companies whose whole existence is to put pressure on MPs to argue and vote in particular ways, breeds this corruption. When ministers are forced out they deny any wrongdoing. The accusations go right to the heart of the Tory government over the past 15 years. Margaret Thatcher's son is supposed to have received � million `commission' for brokering an arms deal between Britain and Saudi Arabia. Jeffrey Archer, close friend of Thatcher and of John Major, bought �,000 worth of shares in Anglia Television the day after his wife as a director of the company was informed of a takeover which was to raise the share price. Lady Porter--former leader of the rabidly Thatcherite Westminster council--stands accused of adopting a housing policy which drove the poor, homeless and Labour voters in general out of marginal wards and if possible out of Westminster altogether, while at the same time the council funded the building of luxury flats in the borough to attract Tory voters. Close links between companies funding the Tory Party and their directors being awarded seats on various government appointed quangos are now commonplace. A bank with close links to the Kuwaiti government has also given very big donations to the Tories. The principles of the free market have affected every part of government and parliament. These principles are that the Tories and their friends ensure the maximum profits and perks for themselves, while the rest of us can suffer. Many of the revelations about money for questions came out in the same week that the Tories introduced their own form of workfare--the jobseeker's allowance--for the unemployed, with pious statements that no one should expect something for nothing. We are told that there is no money for better healthcare or public transport, when astronomical sums are available for government ministers and their hangers on. A number of accusations are focused on the right wing of the Tory Party, who are most rabid in their pursuit of the fruits of the Thatcher years. Neil Hamilton and Michael Colvin were both opposed to sanctions against apartheid South Africa, and both worked for Strategy Network International, which represented a number of South African companies. The Financial Times reported that 'a left-right split opened in the cabinet' over whether industry minister Neil Hamilton should resign. One of his main defenders was right wing pretender for the party leadership Michael Portillo. The Tories are trying to claim that this corruption only involves a small number of people and that it covers all parties. However, it is clear that the corruption is concentrated overwhelmingly in the party of a government which has bent over backwards to favour big business for 15 years. It stretches from government right through to MPs' wives and relatives. A recent newspaper report said that a number of MPs and their wives regularly phone British Airways to ask to be upgraded from economy class to first class. The boards of NHS trusts, local colleges and other quangos are stuffed with Tory supporters. None of these bodies are at all democratically accountable. Recent revelations demonstrate how unaccountable the whole sham of parliamentary democracy really is. People who vote for MPs have no real control over their behaviour, over what they are paid, or which other businesses they work for while they are an MP. Every government decision is lobbied and campaigned for and against by a series of people whose interest is not in the well being of the majority, but in whether a particular narrow interest holds onto its profit. There is less and less accountability of even the most remote kind. Control of health, education and many other local services is now directly under the Tories and local business. Privatised industries are run by people whose salaries have multiplied since they were in the public sector. Former Tory ministers responsible for privatisation join the boards of the industries or the banks and financial consultancies which privatised them in the first place. The disgust which the overwhelming majority of ordinary people feel at all this can find no expression because the corruption is first covered up, then regarded as exceptional and only then subject to (usually secret) investigation. The solution, according to many MPs, is for parliament to make minor reforms and to hold an investigation into corruption. Who has any faith that things would change? There would be a few cosmetic changes and then everything would carry on as before, because it is the whole system which leads to corruption. This is the problem that the Labour Party has. Many of its MPs (although not all--some are up to the same thing) are no doubt horrified at the cesspit in which they find themselves working. But they have a problem. They accept the whole parliamentary charade. They mix with the Tories; they address them respectfully in debate. It is only very rarely that there is any sense of real anger in the parliamentary attacks of Labour MPs. They will do nothing to really rock the boat, because they believe parliament is the only way of changing anything. The most effective opposition to the corruption around Westminster, therefore, is likely to come from those who want a really democratic and accountable system, run from below, by and for working people. Riots took place in the richest parts of London last month. They were triggered by the final parliamentary debates around one of the most reactionary pieces of legislation for many years. The Criminal Justice Bill will severely limit the right to 'protest, picket and party', as it says on the placards produced by the Coalition against the Criminal Justice Bill. 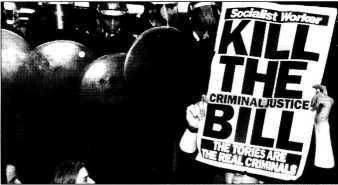 The 80,000 demonstration against the bill on 9 October ended in a riot which went on for several hours in Park Lane. The main demonstration had already moved peacefully into the park, when the police attacked its tail end. The reason? To prevent one sound system from entering the park. Over 1,000 police in full riot gear were deployed to stop this dangerous threat to public order. The result was many young protesters injured and some arrested. Even more riot police were on the scene to protect MPs from people wanting to lobby them in protest at the bill a few days later. It was impossible to move around Westminster on the night the bill was debated without tripping over some of the 2,000 riot police on duty. Those wanting to lobby found they had to run a gauntlet of police with helmets and shields. If this is the response before the bill becomes law, what will it be like afterwards? Exactly how much money is this Tory government prepared to spend on the policing of completely harmless activities while it cuts back spending on health and welfare? Support for this policing comes from the top. The Park Lane riot took place two days before the start of the Tory Party conference. The home secretary, Michael Howard, described the lobbyers as a 'rabble' and said that the police were needed to protect MPs. Labour MPs who supported the demonstrators were penned into the House of Commons by the police who attacked demonstrators with batons outside its gates. The bill is so bad that even some top police officers have spoken out against it. They are not, in general, opposed to breaking up raves and arresting hunt saboteurs. But they feel that the provisions of the bill are unnecessarily rigid, that there are already adequate laws to deal with the offences and that the new laws will only create more confrontation. The bill has been allowed a relatively easy passage through parliament, partly because most people have been unaware of many of its provisions. It has been projected as affecting no one unless they are travellers or ravers. In reality it will centrally affect all those wanting to organise demonstrations, to picket and to build campaigns. The much larger number of trade union banners on this march, compared to the last national demonstration in July, shows that more and more people are waking up to what the bill is about. They have little to thank the Labour Party for in this respect. Labour has abstained on the bill, allowing a weak government and unpopular home secretary to get their own way. This is done because it is said there are some good points in the bill--such as: evicting squatters or stopping music being played at night? It is also said that Tony Blair has to be firm on law and order because this is a vote winner. But Blair has allowed one of the biggest attacks on civil liberties to go through: the ending of the right to silence. It is almost inconceivable that after all the recent publicised miscarriages of justice and cases of police corruption Labour should collude with the Tories in introducing a measure which will ensure more injustices over the years to come. Yet that is exactly what is happening. Opposition to this bill is already widespread. The Coalition has grouped around it a wide range of organisations, unions and individuals who have come together in opposition to the bill. The task ahead once the bill becomes law is both to get across the seriousness of its provisions, and to ensure that we mobilise against specific instances where it is used and hopefully make it ineffective. It couldn't have happened to a nastier minister. No MP more persistently and offensively represents the true spirit of Thatcherism than Neil Hamilton, the Minister for Corporate Affairs. 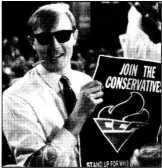 Hamilton first came to public notice when he attended the 1973 conference of the Italian Fascist Party, MSI, as an observer from the Young Conservatives. Since he was elected Tory MP for Tatton in 1983, he has rested the extreme Thatcherite right, constantly baiting true unionists, the unemployed and the dispossessed. He flaunts the sterile wit and pervasive arrogance of all the Thatcherite Young Turks who grew rich and famous at the expense of others in the Golden Years of Private Enterprise. Hamilton denies being paid �000 a time to ask questions, but he does not deny a sumptious weekend in Paris at the expense of the qhastly old liar and cheat Fayed, the chairman of Harrods. Dinner each night for the MP and his wife cost the Harrods boss �2. How that figure must have delighted 'scroungers' in bed: breakfast accommodation so often mocked by Hamilton and his ilk. The media have discovered something they call 'parliamentary sleaze'. Yet this is one the most time honoured institutions of our mother of parliaments. Many and varied are the ways in which corporate power in capitalist society cuts down all semblance of representative democracy in parliaments and local councils, but the most obvious of them all is buying the representatives. If MPs are paid more by an 'outside interest' than by their constituents, then it follows that they will consider the interests of the corporation before those of their constituents. The MP for Loamshire (�,000 a year) prefers to be the MP for Blue Blooded Merchant Bank plc (�,000 a year and rising). Representations plays second fiddle to corporate public relations. Before 1975 MPs didn't even have to declare which firms paid them. The Poulson scandal of the late 1960s and 1970s revealed a clutch of MPs using questions, motions, dining rooms and debates to promote the interests of the corrupt architect. One MP had to resign, and the Register of Interests was set up. No one took much notice of it, even during the 1980s as the number of consultancies, directorships and perks showered on MPs, almost all of them Tory, rose to obscene levels. One Tory MP was so bemused by the way in which his colleagues were growing rich that he actually advertised for a company to take him on as a consultant. The private dining rooms of the House of Commons--why are there private dining rooms there anyway?--became a huge commercial undertaking whereby corporations offered their customers the best food and drink, all consumed in an intoxicating atmosphere of democracy. How wonderful to drink a toast to the hierarchs of the Hanson Trust after a glamorous dinner in the ancient seat of parliament! If parliament was indeed composed of representatives there should be no 'outside interests' whatsoever, MPs should, get their salary and not a penny more. Their perks and trips abroad should be ruthlessly wiped out, and their activities subjected to the most rigorous public scrutiny and disclosure. That is what the new House of Commons Privileges Committee should recommend. But since the committee consists of seven Tory MPs, all with business interests, sitting in secret, the chances of even the mildest restrictions on rampant sleaze are spectacularly low. The Freedom Party won 22.6 percent of the vote in the Austrian elections last month. With 42 seats in the new parliament it is only ten seats behind the Tory People's Party which was in coalition with the Social Democrats. The Social Democrats have dominated Austrian politics for the last 40 years and remain the largest party. With the two parties of the coalition winning less than 80 percent of the vote for the first time since the end of the war, Austria is entering a period of political instability. Haider, leader of the Freedom Party, is notorious for comments he made in 1991 praising Hitler's employment policies. He campaigned relentlessly on an anti-immigrant platform, arguing that immigrants were responsible for serious crime and should be expelled. He also fought to have the number of non-German speaking children in primary school classes reduced. His racist message struck a chord because he related to the resentment many Austrians feel about having to pay for austerity measures the government says are inevitable. He campaigned for a radical overhaul of the state bureaucracy, targeting waste and featherbedding. Disillusion has not been one way. The left leaning Greens and the Liberal Forum saw their vote increase. The real danger, however, is that the Tory People's Party will flirt with the far right in an attempt to avoid losing their base to Haider. There are rumours that they will form a coalition government with the Freedom Party. The extreme right also did well in local elections in Belgium. The racist Flemish Nationalist Party, the Vlaams Blok, consolidated its hold on Antwerp with a 28 percent vote. In the French speaking south of the country, Wallonia, and in Brussels, the fascists made significant gains for the first time. The National Front, closely modelled on Le Pen's French fascists, won council positions in 19 of the capital's communes. In Liege, the capital of Wallonia, they won four seats. As in Austria, the extreme right campaigned on an anti-immigrant platform. Antagonism between the two language communities also played its part, feeding off resentment against the federal government, where the Christian Democrats and the Socialists share office. However, there is still nervousness about too explicit an identification with Nazism. After the elections, when television showed footage of a newly elected Brussels councillor urinating on a Jewish grave, the outcry forced the leader of the National Front to disown him. The anti-Semitism which links the present far right with the prewar and wartime Nazi movement is just below the surface. But the far right is still forced to play respectable politics. Discontent with the economic situation can also move to the left. Over 30,000 high school students, their teachers and parents recently demonstrated in Brussels in protest at education cuts. This zigzagging characterises other European countries. In Italy the pro-Berlusconi euphoria is evaporating rapidly. Hailed as the man to overcome graft and corruption in the state machine, he is becoming as tarnished as the old Christian Democrat and Socialist leaders. Mr Clean is now under suspicion of exploiting his political position to benefit his huge publishing and media empire. The budget, which was presented for presidential approval with only 15 minutes reading time before the deadline, contained measures which would have ruined the finances of the state television (to the obvious benefit of his Fininvest company). He was forced to drop the proposals. His coalition is now looking as wobbly as any that characterised the old political set up. This has played into the hands of his coalition partners, particularly the fascists and their leader, Gianfranco Fini, whose popularity in the opinion polls has increased. But that is only one side of the picture. The other is the enormous anger provoked by government plans to cut pension rights for millions of Italians. The general strike against pension cuts closed down large parts of Italy. In France corruption is also rife in the political establishment. Alain Carignon, the communications minister, resigned in July as a result of allegations of illegal payments for public work contracts in the city of which he is mayor, Grenoble. He is now in jail. Recently another minister, Gerard Longuet, was forced to resign over backhanders. The revelation of corruption, if not of Italian proportions, is allowing Le Pen's National Front to stage a modest revival. This is only a few months since it was relegated to the margins by the wave of working class anger which started with the Air France strike and climaxed with the demonstrations against cutting the minimum wage for youth. Meanwhile, the re-election of Helmut Kohl's conservatives in Germany is unlikely to provide any stability there, with the coalition hanging on by a narrow margin. However, here, the far right Republikaner saw a dramatic fall in their vote. The political structures of the postwar settlement are becoming less stable as resentment grows at the failure of the system. The zigzags from explosions of working class anger to renewed advance for the far right and back again are the sign of what a real socialist alternative could build on and a warning of what could happen in its absence.